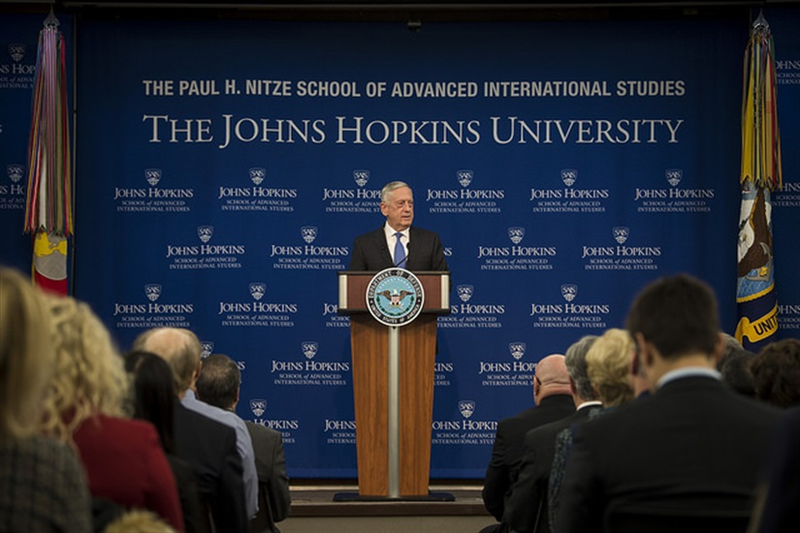 On January 19th 2018, U.S Secretary of Defense Jim Mattis unveiled the U.S. National Defense Strategy. The document supplements the National Security Strategy (NSS), which was published a month before, on December 18th 2017, and will likely complement the coming National Military Strategy, and the Nuclear Posture Review. The NDS is meant to present the Department of Defense’ take on the strategy and principal goals of the United States in the international arena, picking up on the themes laid out in the National Security Strategy. The document constitutes a significant departure from positions held by the previous Administrations, and by doing so heeds to the political and strategic vision of the current Administration. Unlike previous similar documents, the newest NDS focuses ostensibly on the strategic competition between the United States, People’s Republic of China, and Russian Federation. The 2018 National Defense Strategy is the first document of its kind released by the US government in nearly 10 years, with the previous NDS published in the final days of the George Bush tenure, in May 2008. Even though the complete text of the National Defense Strategy is classified, the Department of Defense did release a 11 page summary of the document, underlining the key themes and features of the Trump’s Administration policies in the coming years. The fact that Secretary Mattis personally unveiled and signed the document, indicates that, unlike some of its predecessors, the 2018 Defense Strategy is intended to truly become a stencil for the changes in the DoD’s force structure, and strategic posture. There is a good reason for this seriousness, as the document is meant to guide the US through what the Administration perceives to be a new emerging strategic reality, that of return of realpolitik, and rivalry between great powers, at a time when the advantage the US enjoys over its competitors has diminished. The significance of the document lies in the clear cut departure from the post-cold war mindset, which focused primarily on threats posed by the non-state actors, such as terrorist groups, and underscored the role played by international organizations in maintaining international order and stability. It would appear the Department of Defense under President Trump clearly perceives the world through the prism of political realism, and underscores the importance of concepts such as the balance of power, and the inevitability of competition between nation states, which it considers to be primary actors on the international stage. The NDS is, in many ways, a representation of the positions and attitudes held by the current Administration. It is blunt, not shying away from naming China and Russia as “revisionist powers” – strategic competitors who are actively trying to undermine the US interests worldwide. Following those two states, which are clearly prioritized, come the Islamic Republic of Iran and North Korea – hostile actors and rogue regimes which threaten the regional stability and the US itself due to their WMD and ballistic missile assets. Those four states, alongside non-state actors, such as terrorist organizations threaten the stability of the existing international order, and thus the balance of power favorable for the United States. The US administration seemingly appears to consider the threat posed by China as the most prevalent, particularly in regards to South China Sea, which the Chinese assert the right to control, ignoring the fundamental tenets of the International Maritime Law, symbolically and factually rejecting the „rules of the road”, which the US wants to preserve. Russia on the other hand is mentioned in two contexts. First, due to de facto wars of aggression it waged against Georgia and Ukraine, with the latter resulting in annexation of Crimea, and second, because of the rapid and far reaching modernization of its Armed Forces, with a special mention of the expansion and modernization of its nuclear arsenal, and engaging in hybrid and cyber, and information warfare against the US and its allies. Lastly, hostile non-state actors such as terrorist organizations, international crime syndicates, hackers are listed as adversaries, threatening not only interests of the US and its allies, but also constituting a direct threat to the US territory. This is very different to, for example, the 2014 QDR, which focused first and foremost on non-state actors, and only briefly touched upon the relations between those two aspiring superpowers and the US – and when it did, it spoke of engaging in a constructive dialogue, fostering communications and underscored the role played by international institutions. Conversely, the goal of the current NDS is to provide the President with „options to negotiate from the position of strength”, and predicts „the re-emergence of long-term, strategic competition between nations”. Furthermore, the NDS underscores in no uncertain terms the shortcomings and stresses the necessity of revamping the entire DoD structure, starting with acquisition procedures, and ending with military education. The criticism of the current he DoD structures and procedures, resulting in „strategic atrophy and erosion of competitive military advantage”, and the changes meant to rectify the situation constitute another key element of the 2018 NDS. The goal set out in the new Defense Strategy is to be able to effectively defeat aggression of one of the main strategic competitors, while retaining the simultaneous ability to deter opportunistic aggression elsewhere. In a non-war time scenario, the US is to uphold and enhance its ability to deter aggression in the three regions that were ascribed a paramount importance – Indo-Pacific, Middle East and Europe, while at the same time degrade the WMD and terrorist threats coming from non-state, or rogue state funded actors, as well as deter strategic nuclear and non-nuclear attacks. In keeping with the no-nonsense message of the NDS, the section of the document that focuses on the modernization begins by stating that he US „cannot expect success fighting tomorrow’s conflicts with yesterday’s weapons or equipment”. Updating the nuclear triad is among the key areas requiring greater focus, especially in context of the continuous Russian modernization programs. The document also states the necessity to further the efforts aimed at establishing a more significant military presence in space. The cyber domain is another dimension where the NDS sees potential for improvement. Somewhat related to this, are the efforts to increase the emphasis on cutting edge technologies, such as machine learning, utilizing artificial intelligence, and the ability to quickly integrate and apply those novel concepts into military structure. NDS also notes the necessity to streamline the logistical procedures, C4ISR systems, as well as ensure more agile, dispersed and maneuverable forward force, that would be capable of elastic response to threats. Restructuring the Department, and changing its mindset, as well as the obsolete procedures and doctrines that date back to the immediate post-Cold War period is a prerequisite for the future success of the US Joint Forces. On top of the hardware and structural modernization, NDS also proposes a far reaching revamping of the „corporate culture” within the Defense Department itself. The document stresses the need for more flexibility and ability to scale operations down or up, depending on the context in which they are to operate, as well as „calculated risk taking and culture of experimentation”. Likewise, the acquisition procedures, the overbearing bureaucracy, focused on risk aversion is to be changed in favor of a „culture of performance”, fast and adaptive decision making processes and streamlined procedures; „if current structures hinder substantial increases in lethality or performance, it is expected that Service Secretaries and Agency heads will consolidate, eliminate, or restructure as needed”. Despite the undertones suggesting strong adherence to the principles of realism, the 2018 NDS has nevertheless stressed the importance of both developing and furthering a system of alliances, particularly in the Indo-Pacific region. While China is not specifically mentioned in this context, it is clear, that the goal of creating „networked security architecture capable of deterring aggression (…) and preserving the free and open international system” is a clear allusion to Chinese posturing in the South and East China Seas. As far as Europe and NATO are concerned, the document reinforces US adherence to the principles of Article 5 of the NATO Charter, presumably addressing the concerns certain members of the Alliance have expressed in context of some of the Trump administration statements. At the same time, the running theme of Donald Trump’s campaign and tenure, namely that of fulfilling the 2% GDP defense spending is also mentioned in the NDS. On top of these two regions – and two strategic competitors – the NDS also lists Middle East as a region where the US will seek to „consolidate gains made in Iraq, Afghanistan and Syria” and counterbalance Iran. African continent is mentioned in context of the asymmetric threats such as terror groups, human trafficking and arms smuggling. At the same time, it is hard not to notice, that the running theme of political realism is still clearly visible as far as this dimension of the NDS is concerned – the US is doing away with liberalism and Willsonian principles that were seemingly held dear by the previous administration. The alliances are meant to facilitate a „favourable balance of power”; the US is not looking to „impose our way of life by force”. The 2018 US National Defense Strategy offers a major departure from the previous administrations outlook – it is based in political realism, embracing the concepts such as balance of power, perceiving nation states as key stakeholders in the international arena, instead of reaffirming the liberal international order that was the predominant notion in the US politics since the dissolution of the USSR. In keeping with this approach, the NDS places little emphasis on what constituted important elements in the previous administrations – international institutions, liberal ideas, power sharing etc. Furthermore, it offers a clear gradation of threats – two major opponents – China and Russia are prioritized, followed by Iran and North Korea, and lastly terrorists groups, crime syndicates and so forth. It also provides a sober analysis of the current position of the US in the international arena, and an acknowledgement of how it deteriorated from the position of unquestionable hegemony it enjoyed in the 1990’s, and a summary of shortcomings of the Joint Force in its current state in terms of equipment, doctrine, and bureaucratic procedures. The period of unmatched military, economic and political advantage the US enjoyed under Pax Americana has ended; the world is now moving away from unipolarity of the 1990’s towards a period of competition with a number of other emerging great powers. Last but not least, the 2018 NDS recognizes the emerging battlefields – space, cyber, hybrid and information warfare as crucial elements in need of greater focus. To better accommodate to those challenges, the NDS proposes major alterations in the way DoD functions, and a shift in corporate culture, from less bureaucratic and risk averse, towards more agile and responsive.